The Grand Opening of the UMR Solar Village will be on October 20th, 2006. We will also have the ground breaking ceremony for the 2007 solar house project. We envite everyone to come check out the village and support our renewable energy awareness efforts. The Solar Village will be open for tour on October 7th, 2006 for the National Solar Tour put on by American Solar Energy Society. Come on by and see UMR’s Solar Village! The village is located 808 W. 10th St. across from the Gale Bullman Multipurpose Center. 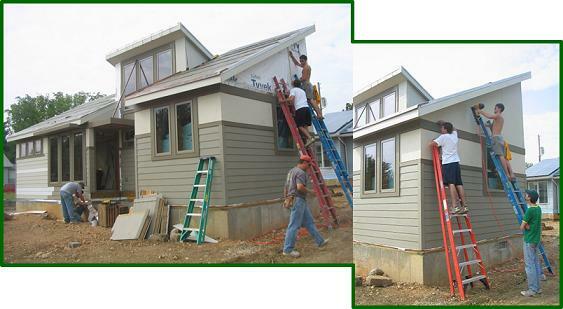 Today we finished the siding on the 2005 house. The outside is almost complete! All that is left is the solar panels and painting the siding. The 2002 house only has interior painting left! The inside of the house was a dust storm with all the sanding going on today. Thats going to take a lot of clean up.